Cleopatra soaked the sails of her ships with Rosewater,so that Mark Anthony would know of her impending arrival as the breeze carried its scent. 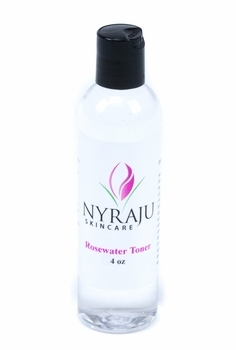 Not only will Rosewater take your breath away as an alluring scent but it is a super-hydrating natural skin toner that balances the pH level of your African American skin, giving it a fresh and clean glow. Scented with Pure Natural Rose essential oil, the organic aloe barbadensis leaf juice in our formula contains seven of the eight essential amino acids and provides nine essential minerals to rejuvenate and revitalize any skin type for women of color, including sensitive, acne-prone, mature, dry, sun-damaged, oily, normal and combination skin. Rosewater not only has a mild and relaxing scent, but also nurtures, strengthens and soothes your skin. Disclaimer: Results may vary from person to person. 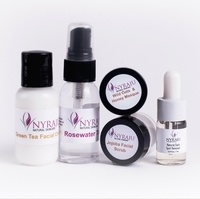 Nyraju Skin Care does not represent or warrant the accuracy of any statements or product claims made in this section. We do not compensate our clients for any opinions expressed in this section. Juliette, OMG!!!! I am flipping out over how excellent your products are for my skin. I received my package today and I decided to try the facial cleaner, toner and antioxidant face cream. My skin felt so soft and silky until I couldn't stop touching my face. I am telling everyone that I know about your website. I can't wait to try the honey masque. Thank you so much for excellent products for women of color and fantastic customer service. Another order is forthcoming. You are truly a blessing! I didn't know what a toner was used for, then my girl friend told me to try it and see the difference in my skin. It really helped me. You told me to put it on my face before the moisturizer and it helped my makeup go in really good.